Writing became Marcia’s outlet in the late 1970s when she began journaling. In the 80s she wrote user manuals for new wireless products, and in the 90s she wrote articles for technical magazines but longed to write from her heart. After her children graduated, she worked internationally for several years, helping to establish wireless networks in Hong Kong, Taiwan and India. Then, as VP of Product Marketing for an international software company, she spent her time traveling the world including trips to London, Malaysia, Singapore, Australia, and New Zealand. She soon realized she couldn’t breathe deep enough and still show up at the office. In 2005, a line from a Mary Oliver Poem hit her hard, “…are you breathing just a little and calling it a life?” (“Have You Ever Tried to Enter the Long Black Branches?”) That’s when she jumped off the fast track. 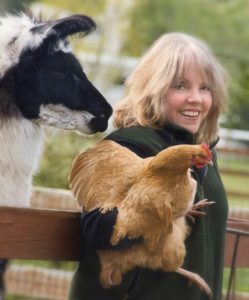 She left her corporate career, bought a llama farm in Poulsbo, WA, and opened a B&B. She served fresh eggs provided by over 20 hens while her comical ducks and geese ate the slugs in the garden and five entertaining llamas provided fiber that became beautiful rugs. As much as she loved the animals, she found that farm chores, breakfast preparation, and laundry left little time for writing. She did however, manage to complete her memoir in the winter of 2009. In 2011 she sold the farm and moved to a tiny beach cottage in Port Gamble, WA where she wrote her first novel, Secrets Lost. In 2013 she moved to Port Townsend, and has finished her second novel, Kala’s Choices. She lives with her Havanese puppies, Dora and Ellie. © 2019 Copyright © 2017 Marcia Breece - Publishing Partners - All Rights Reserved.